Zinder was the former capital of Niger before Niamey was declared as its official capital in 1926. Zinder, formerly also spelled Sinder, is the second largest city in Niger, with a population of 170,574 by 2005 was estimated to be over 200,000. It is situated 861 km east of the capital Niamey and 240 km north of the Nigerian city of Kano. 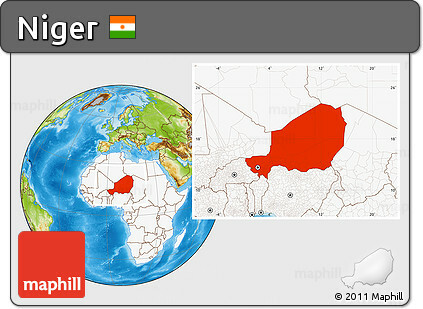 Niger is primarily divided into seven regions and one capital district. Niger shares its territorial boundaries with seven other African countries. They being Nigeria, Chad, Algeria, Mali, Burkina Faso, Benin and Libya. Niger is a developing country. It ranks 167 out of 169 countries in terms of the United Nations’ Human Development Index (HDI). The GDP of the country is 10.75 billion dollars and the economy is based primarily upon internal markets, subsistence agriculture and export of raw commodities. Japan, Nigeria, France, Algeria and Belgium are the main trading partners of the country. Niger exports Uranium ore, livestock, cow peas and onions while it imports machinery, food, vehicles and petroleum. The country of Niger is one of the hottest countries in the world and is famously nicknamed as ‘Frying Pan of the World’. It can get hot enough to make raindrops evaporate before they hit the ground. Niger possesses a sub-tropical climate, with the majority of the land mass dominated by an arid, desert environment, making the country hot and dry. There is also an area of Niger with rolling savanna grasslands, in the south, turning into hilly terrain in the north. In the south east of the country, the portion of Lake Chad which Niger shares with neighboring countries also has a cooling and moist effect on the climate, which is otherwise constantly hot and dry. Greboun is the highest point in Niger. It stands approximately 6,379 feet (1,944 meters) tall. Mount Greboun is a 5,592 ft / 1,705 m mountain peak in Agadez, Niger. Based on peakery data, it ranks as the 6th highest mountain in Agadez and the 6th highest mountain in Niger. The nearest peaks are Ihouilene, Ilem, Essa, Tamazour, Tchiouanki, and Adrar Temouroudout. Niger is home to one of the world’s largest protected reserves, the Air and Tenere Natural Reserves, which is the refuge for animals like addax, Cheetah, Oryx and the gazelle. This is the largest protected area in Africa, covering some 7.7 million ha, though the area considered a protected sanctuary constitutes only one-sixth of the total area. It includes the volcanic rock mass of the Aïr, a small Sahelian pocket, isolated as regards its climate and flora and fauna, and situated in the Saharan desert of Ténéré. The reserves boast an outstanding variety of landscapes, plant species and wild animals. Agadez is the largest city in the country of Niger. Agadez in Niger is important and famous as a market town of the country. Agadez Attractions include the Mosque of Agadez which was built in the 16th century. Agadez is also a center of transportation of uranium, which is mined in the area. The other attractions of Agadez include the central market, the Sultan’s Palace. There is a camel market in the city. The tourists to Agadez can also visit the shops were silver articles are sold. In Agadez another interesting spot is the Croix da Agadez. The metal works which are available in the Artisan Center is also very famous in the city.. The Nigerian flag is perfectly square in shape and the colors of orange, white and green stand for the Sahara desert, purity and innocence, and green vegetation and fruitful agricultural areas of the country respectively. Tuareg and Inadan men wear veils. Although the Tuaregs are Muslim the women do not cover their faces. The Tuareg are best known for the men’s practice of veiling their faces with a blue cloth dyed with indigo. Early travelers’ accounts often referred to them as the “Blue Men” of the Sahara Desert, the region where many Tuareg live. It is believed that the Tuareg are descendants of the North African Berbers, and that they originated in the Fezzan region of Libya. They later expanded into regions bordering the Sahara, bringing local farming peoples into their own society. A dinosaur named Nigersaurus has been discovered in Niger. It had a long neck and a mouth like a hammerhead shark with up to six hundred teeth for grazing ferns. Nigersaurus is a genus of rebbachisaurid sauropod dinosaur that lived during the middle Cretaceous period, about 115 to 105 million years ago. It was discovered in the Elrhaz Formation in an area called Gadoufaoua, in the Republic of Niger. Capital City: Niamey is the capital and largest city of the West African country Niger. Niamey lies on the Niger River, primarily situated on the east bank. It is an administrative, cultural and economic centre. Religion: Islam is the dominant religion in Niger and is practiced by 94% of the population. The vast majority of Muslims are Sunni of Maliki school of jurisprudence. Other religions practiced in Niger include Animism and Christianity.